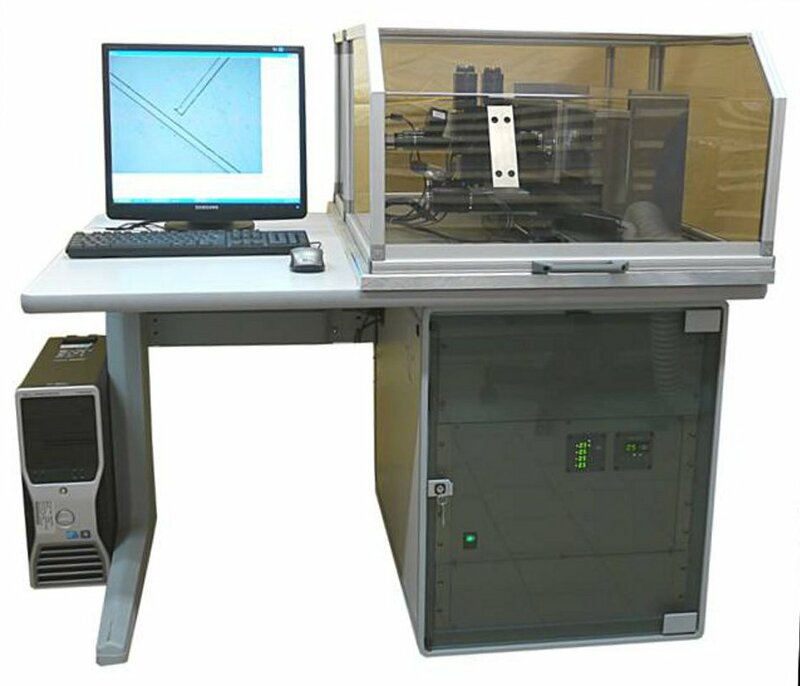 OpticMac5 is a CNC micro-milling machine equipped with an optical microscope. This microscope allows a very high accurate positioning of machining of about some microns. This microscope also allows to monitor the machining. Usually, the channels and cavities are engraved by lithographic tools leading to only one engraved depth. The consecutive machining by conventional milling machine is often not possible due to the difficulty in having the right positioning of the machining with respect to to the already engraved channels. Due to its optical positioning with accuracy in the micron range, Optimac5 allows to overcome this difficulty. It becomes possible to combine thermoforming technique with machining with 'shaving removal'. 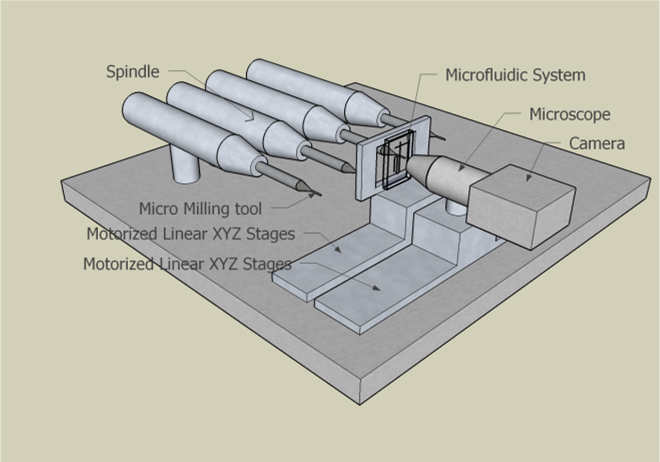 This machine is equipped with 4 ultra high accurate spindles. Each head can be equipped with a milling tool having various shapes and diameter as smaller as 10 µm. This set of 4 milling tools allows making a complete machining without tool changing, for example to implant fluidic connector in a microfluidic device. This feature is very useful because tool changing can be time consuming in the µm range of micron accuracy. The run-out of the spindles is lower than 1µm and the main machine accuracy is about 5µm. The 4 Machining heads are equipped with 2 fluidic circuits, one for the cooling liquid (generally pure water) and the other for drying by air. All commands are controlled by the computer. This CNC machine is interfaced with commercial machining software by a G code interpreter. The machine is compatible with a clean room environment due to a complete machine body combined with an air exhaust system. All mechanical parts and electronic units are integrated in an office desk type with the following outside dimensions(WxDxH): 1.20mx0.8mx1.50m.